JULY 11: The Grizzlies have officially signed Omri Casspi, the club announced in a press release. JUNE 30: The Grizzlies have agreed to add forward Omri Casspi on a one-year deal, ESPN’s Adrian Wojnarowski of ESPN reports. Memphis would mark the 30-year-old’s seventh NBA stop since 2011. Casspi’s one-year deal will be a fully guaranteed, minimum-salary contract, tweets Chris Herrington. In 53 games for the Warriors prior to being cut late in the season, Casspi averaged 5.7 points and 3.8 rebounds per game. Despite the modest numbers in 2017/18, however, Casspi has carved out a nine-year career as a solid depth piece and should help a Grizzlies team intent on returning to contention for a playoff spot. JULY 7: The signing is official per a news release from the team. JUNE 30: After reaching an agreement to retain Paul George, the Thunder aren’t done. 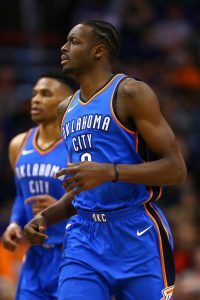 According to ESPN’s Adrian Wojnarowski (via Twitter), Oklahoma City has reached an agreement with forward Jerami Grant on a three-year contract worth $27MM. Grant will have a player option on the third season, Wojnarowski adds (Twitter link). Thunder officials had feared that Grant would get a better offer elsewhere, notes Alex Kennedy of Hoops Hype (Twitter link). However, Oklahoma City was able to keep him in the mix even after committing a four-year max deal to George. The 24-year-old forward just completed his second straight productive season in OKC, averaging 8.4 points and 3.9 rebounds as a valuable member of the Thunder’s reserve squad. He was particularly solid in the postseason — in the first round against the Jazz, the Thunder had a +8.9 net rating when Grant was on the court, and a -17.1 net rating when he sat. Oklahoma City had a memorable night on the free agent front, but also an expensive one. Grant’s new contract, plus the four-year, $137MM deal for George, represents a lot of new money for a team that already had luxury tax concerns. It could be a sign that management intends to either pursue a buyout with Carmelo Anthony or waive him and use the stretch provision on his $27.9MM salary. Alex Abrines, Patrick Patterson, and Kyle Singler are other candidates to be traded or waived to cut costs. 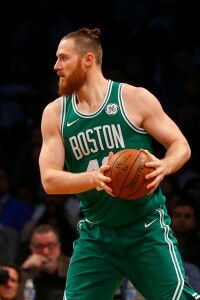 JULY 7: Baynes has formally signed his new contract with the Celtics, according to the NBA’s official transactions log. JUNE 30: The Celtics have reached an agreement with free agent center Aron Baynes, reports Shams Charania of Yahoo Sports (Twitter link). According to Charania, Baynes will re-sign with Boston on a two-year, $11MM contract. The second year will be a player option, Charania adds (via Twitter). A. Sherrod Blakely of NBC Sports Boston first reported several days ago that Baynes would likely stick with the Celtics as an unrestricted free agent. Baynes, who was playing on a one-year, $4.33MM deal in 2017/18, averaged 6.0 PPG and 5.4 RPG in 81 regular season games (18.3 MPG) for the Celtics. The 31-year-old was also a key contributor in the postseason, flashing a newfound outside shot — after having made just four three-pointers over the course of his six NBA seasons, Baynes knocked down 11 of 23 three-point attempts in the playoffs. Having initially signed Baynes during the 2017 offseason, the Celtics hold his Non-Bird rights this summer. Those rights would allow the team to offer a starting salary of up to $5,193,600, which is likely the route that Boston is taking. Using Baynes’ Non-Bird rights would allow the C’s to retain their mid-level exception for another move. Baynes was the No. 41 free agent on our list of 2018’s top 50 free agents. JULY 6: McDermott’s contract is now official, according to a press release from the Pacers. “In Doug’s case, we were looking for elite shooting, but we were also impressed with how he moves without the ball and his spot-up shooting,” said president of basketball operations Kevin Pritchard. JUNE 30: The Pacers have agreed to a three-year, $22MM deal with Doug McDermott, Adrian Wojnarowski of ESPN tweets. The small forward comes off of a year split between the Knicks and the Mavs. In McDermott, the Pacers will add a solid perimeter threat with size. The 6’8″ forward is a career .403 three-point shooter and posted a .494 average in 26 games with Dallas. Despite his solid stint with the Mavericks, McDermott was not made a restricted free agent this summer. Dallas initially tendered a qualifying offer to the veteran sharpshooter, but withdrew it shortly thereafter, ensuring that McDermott would be unrestricted. The Mavs intended to use a significant chunk of cap room on DeAndre Jordan, and didn’t want to carry McDermott’s $10MM cap hold on their books. McDermott will add valuable depth to Indiana’s rotation, slotting in behind starting three Bojan Bogdanovic. Meanwhile, the Pacers should still have cap room available to add another player or two. Community Shootaround: Superteam in L.A.? Speculation continues to grow that the Lakers will land the biggest prize of the summer in LeBron James, but the other pieces they were hoping for appear less certain. Lakers fans watched in anticipation today as LeBron took a flight from his vacation spot of Anguilla to Van Nuys Airport in Los Angeles. It could be a clue or it could just mean that James and his family were returning to their summer home. Halfway across the country, Thunder fans are finding hope in a “summer hype house party” hosted tonight by OKC star Russell Westbrook. Teammate Paul George is on the guest list for the bash, which would serve as an ideal location if he wants to announce that he’s staying in Oklahoma City. Guests are required to sign a non-disclosure agreement, which adds to the anticipation that major news is on the way. George is one Los Angeles native the Lakers were hoping to add to their mix. The other is Kawhi Leonard, who has requested a trade out of San Antonio. However, the Spurs are seeking a “clean out the cupboard” type deal, according to ESPN’s Brian Windhorst, and the Lakers have been unwilling to meet their price. He adds that L.A. views Leonard as a “distressed asset” who is almost certain to leave San Antonio next summer, so the Lakers’ front office is unwilling to give the Spurs what they want. The Celtics and Sixers are also in on the bidding for Leonard and both might be willing to make better offers. With the start of free agency less than 30 minutes away, we want to get your predictions. James, George and Leonard — how many of them will be Lakers when the season starts in October? Please leave your responses in the space below. According to Marc Stein of The New York Times, there’s growing reason to believe that the Thunder may have a verbal agreement with Paul George considering that the soon-to-be free agent is currently partying with Russell Westbrook and members of the club’s front office at an Oklahoma City house party. With less than two hours until teams and players can formally negotiate, Stein tweets that the Thunder will have fooled many if the two parties don’t come to an agreement on a two- or three-year max deal quickly. It was Chris Mannix of Yahoo Sports who first reported that members of the team’s front office were in attendance at the shindig but ESPN’s Adrian Wojnarowski has since tweeted that Thunder general manager Sam Presti had specifically wanted to hold the team’s meeting with the free agent in Oklahoma City as part of it’s year-long recruiting effort to retain him. As Royce Young of ESPN writes in a feature on the party, Westbrook is hosting the 500-person get-together that has been branded as a “summer hype house party”. According to Young, Westbrook flew eight hours from Hawaii, where he was vacationing with his family, in order to host the event. DeMarcus Cousins Next Target For Lakers? With Paul George looking more likely to stay with the Thunder, the Lakers are turning their attention to DeMarcus Cousins, tweets Kevin O’Connor of The Ringer. League sources say that L.A. is considering a short-term max offer for the free agent center. Cousins was headed for a full max deal in New Orleans before suffering a torn ACL in January. The Pelicans grabbed the No. 6 seed without him and advanced to the Western Conference semifinals, raising questions of whether the organization would be fine without him. Cousins has played less than a full season in New Orleans after being acquired in a trade with the Kings, but he has put up All-Star numbers. In 65 games, he averaged 25.0 points and 12.7 rebounds while forming a dangerous frontcourt combination alongside Anthony Davis. In an interview last month with Marc J. Spears of The Undefeated, Cousins said he is happy with the progress he has made and he hopes to be ready for training camp. A disappointing 2017/18 put the Hornets in an awkward position, staffed with enough talent to compete for one of the East’s final playoff spots, yet financially compelled to blow things up and start fresh. This season stands to be different. In a recent interview with Rick Bonnell of The Charlotte Observer, newly appointed head coach James Borrego discusses his vision for the club heading forward. The biggest change heading into 2018/19 is Borrego’s willingness to incorporate 2017 pick Malik Monk heavily in the team’s rotation. Whereas previous head coach Steve Clifford opted to play veterans over youth, Borrego sees Monk as “major player for the team” with the potential to be an elite shooter. Borrego also notes that it’s a priority of the Hornets to add a ballhandler that can serve as the primary backup point guard to Kemba Walker. The Hornets will bring Chad Iske aboard to join James Borrego‘s coaching staff, Adrian Wojnarowski of ESPN tweets. Iske previously coached with the Wizards. A number of veteran playmakers will catch the eye of general manager Mitch Kupchak when free agency begins, Rick Bonnell of The Charlotte Observer writes. Some realistic options are be Shelvin Mack, Seth Curry, Shabazz Napier, Raymond Felton, Dante Exum and Ty Lawson. The Hornets will give Brice Johnson a look when they hold a mini-camp this week, a team press release reveals. Johnson was a first-round pick of the Clippers in 2016 but was waived by the Grizzlies in March after being traded twice to Detroit and Memphis.